THE BLONDE LATTE: "Meanwhile back at mama's..."
As y'all all know I am a huge country music fan and especially love Tim McGraw. This video (down below!!) that I will include explains and includes the title! It is one of my favorites and it feature his beautiful wife.. it is just so sweet! Anyways this post I am really excited about because it is taken inside my house for once and not in the usual spot! I adore this window seat and I am glad to show you guys a little into my life! I know I have featured this bag before but it is one of my favorite "go-to" bags! It is from CalvinMitchell.com it is a one of a kind which makes it extra special to me but they also have a huge variety of bags that I adore.. I find myself on their site all the time just wanting everything! (However I will keep them in on my wish list!) 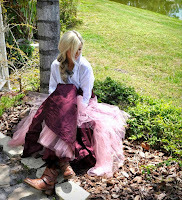 Also I styled it with some knee high boots & this fabulous dress from VintageSouthBoutique.com the dresses are so affordable and just so boho/gypsy/country/chic! I have a part two to this post that will be up either tomorrow or the following day. Also make sure to look for a giveaway I have with BigBoldFierce.com I know you guys will just love! I hope you all are having a wonderful Wednesday.. crazy how it is already midweek! Dress: VintageSouthBoutique.com exact dress: here! Thanks Mel! It is so comfortable!!! Thanks Rhiannon! It is so boho comfy chic! !